Dale Arden Norris, 89, Rockford, IL, died of natural causes at 8:25 a.m., Saturday, February 2, 2018 at Wesley Willows Nursing Home in Rockford. Dale was born on April 20, 1929 to Dr. Glen and Henrietta (Kampert) Norris of Pecatonica. He graduated from Pecatonica High School in 1947 and attended Beloit College. After graduating from Beloit, he was drafted and served two years in the U.S. Army, stationed in Germany. While on leave in Paris, he met his future wife, Johanna Hohenstein. They married June 9, 1956 in San Francisco. After living a short time in Rockford and Freeport, they built a home in Pecatonica in 1959 where they raised their two children and lived until they moved into Wesley Willows in 2015. Dale was an active member of the Pecatonica Fire Department from the age of 14 until he was disabled by a head injury at the age of 85. 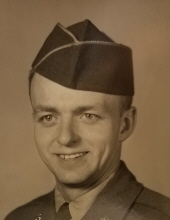 He served on the Pecatonica Village Board for over 30 years, was a life-long member of the Pecatonica United Methodist Church and a former officer of the American Legion Eugene J. Barloga Post #197. Dale is survived by his wife Johanna, his children Rick and Kathleen (Mullins) and granddaughters Bonnie Mullins and Hannah Norris. He was preceded in death by his parents and brother Franklyn. Memorial ceremonies will be held at 10:30 a.m., Saturday, February 16, 2019 in Pecatonica United Methodist Church, 528 Washington Street, Pecatonica, IL with Pastor Mark Gilmore officiating. A visitation will be held at McCorkle Funeral Home-Pecatonica Chapel, 203 W Fifth Street, Pecatonica, IL from 4:00 to 8:00 p.m., Friday, February 15, 2019. Final resting place will be in Pecatonica Cemetery. Cremation rites will be accorded. To send flowers or a remembrance gift to the family of Dale Arden Norris, please visit our Tribute Store. "Email Address" would like to share the life celebration of Dale Arden Norris. Click on the "link" to go to share a favorite memory or leave a condolence message for the family.